This research paper will analyze the role of women in The Odyssey. Women play an important role in Homer's work The Odyssey. Have a research paper written by our literature writers on the significance of women such as Helen, Arete and Penelope within Homer's work. This is literature research paper on the Role of Women in The Odyssey. The author and the work will also be examined. This research paper will analyze the role of women in The Odyssey. Introductory Paragraph: Open with interesting lead material in the research paper. Briefly summarize the works by focusing on the ideas or on the literary element-character, setting, theme, point of view, symbolism, imagery, structure, tone-that you plan to analyze. State the thesis and its supporting points that will be discussed in the body paragraphs. In Homer’s The Odyssey there are a number of human women—Helen, Nausicaa, Arete, and Penelope—who are either married or marriageable and who possess membership in the upper class. Helen, Arete, and Penelope are honorable in the sense of being faithful consorts to their husbands, not temptresses of the femme fatale type. Nausicaa is a young girl of impeccable manners. While Circe, a female goddess, certainly has a ferocious aspect, and Zeus must intervene to pry Odysseus away from Calypso, another female goddess, we can see that these don’t really “count” in terms of Homer’s view of human women which is generally favorable. Of the servant women in Odysseus/Penelope’s household, only a dozen out of fifty went “tramping to their shame” (XXII:449). These are killed near the end and also cannot be considered to “count” because they are of a lower social class than the women who do “count” and because the pressure on them from the suitors would have been enormous. Of the four upper class women we have named, all four fit the faithful consort rather than temptress mold and Penelope’s faithfulness, given what she has had to cope with over Odysseus long absence, is exemplary. Using the supporting points listed above, divide the body of the essay into major sections by using key words from the thesis to show the organization and development of your ideas. The major sections can be broken down into several paragraphs by using the literary analysis pattern of generalization, introductory information for a supporting quotation, the quotation of relevant details, and thorough analysis to show how and why the quotation proves and supports the topic sentence and the thesis statement. Let your paragraphing sense guide you in relation to breaking your discussion into coherent and unified paragraphs. Remember that when you introduce a new concept or subpoint or when your discussion extends more than three-quarters of a page, you should consider starting a new paragraph at some logical point. Certainly Helen had strayed in the past, but when we encounter her by Menelaus side, she has returned to the course of female virtue and it is obvious that her reintegration into family life has been complete. The Helen we have in The Odyssey is a woman who feels quite guilty about her sins of the past. Her first speech ends with her identifying Telemachus correctly and expressing remorse at her own downfall, “The boy that hero left/ a babe in arms at home when all you Achaeans/ fought at Troy, launching your headlong battles/ just for my sake, shameless whore that I was” (IV: 159-62). Later on she also expresses remorse and blames “the madness/ Aphrodite sent me” (IV:193-4). We may say that these expressions of her remorse—coupled with Menelaus’ acceptance of her back into the family and her queenly state and demeanor in the palace, indicate that she is no longer to be considered as Paris’ wanton mistress, but as one who has fully and truly returned to her proper place in Greek society and is now to be considered to be a good and loyal woman. The scene with Nausicaa on the beach and her subsequent modesty in conveying Odysseus to the palace, coupled with Odysseus’ superb correctness, is a wonderful acting out of ideal male-female behavior against a backdrop that is suffused with eroticism. Nausicaa’s concern to forestall gossip reveals her to be a level-headed girl concerned to meets the Greek code of hospitality to strangers while preserving an undiminished reputation. It also reveals that she is thinking what potential gossips would be thinking. Certainly a young woman of this sort is in no danger of growing up as either a woman of the temptress type or as a shrew. 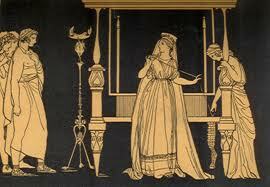 Both she and Odysseus behave according to a strict code of propriety despite the temptations inherent in the situation. There is also no fault to be found in the behavior of Arete, King Alcinous’ wife. She is the perfect, archetypal queen and her actions are the very mirror of what is expected in such a woman. Both Helen (as she now is) and Arete are perfect companion/consorts. But Penelope is the finest of them all. She is subject to great temptations because she has lost hope that Odysseus will ever return and her setting up of the final contest—not knowing that Odysseus, the only man that can string the bow is present in the house--can in no way be considered to be a betrayal of him, but rather must be seen as the action of a good woman who, after fighting the good fight, recognizes the necessity to bow to the inevitable. We may say that Penelope is a female counterpart to Odysseus in important ways that go beyond the mere fact that they are man and wife. If he has wandered through the wide reaches of the earth and even down into the underworld; if he has known captivity, defeat, terror, the loss of comrades, the war at Troy, the enmity of Gods, and, finally, poverty and the mockery of men who seek to take his wife away from him in his own land and own hall, he has endured all of this. And he has endured not simply because he is someone who is able to sweep away all adversaries by virtue of physical force, but because he is wise Odysseus, a man able to estimate what needs to be done, and improvise solutions. Athena in the Odyssey - Athena in the Odyssey research papers write about the role of the legendary Goddess Athena. Telemachus in The Odyssey - Telemachus in The Odyssey research papers overview the character in Homer's classic text. Biblical Matriarch - Convention requires that a woman be a mother of the Tribes of Israel in order to be considered a Matriarch. Analysis of Bless Me, Ultima - This book report revolves around the understanding of the novel “Bless Me, Ultima” by Rudolfo Anaya. Paper Masters writes custom research papers on the Role of Women in The Odyssey analyze the literary element, character, setting, theme, point of view, symbolism, imagery, structure, and tone.